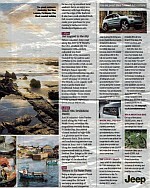 Here are some of the latest reviews of Nolton Stables from press, magazines and travel websites. Actress and cook, Lisa Faulkner, was interviewed about her life in the Telegraph's Sunday Magazine. Following Lisa'a stay at Glebe House last year she answers the question "My favourite place in Britain is..." with "Nolton Stables in Pembrokeshire. 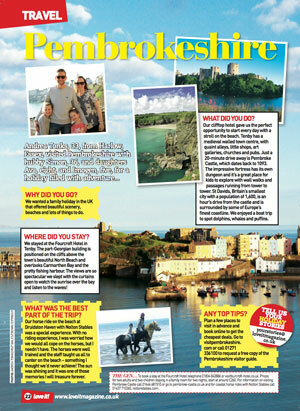 It's a ruggedly beautiful part of the UK and somewhere I'd happily go back as often as possible". Daniel Pembrey visited Nolton Stables for a beach ride and said "Nolton is one of the few places in the land where you can go beach riding and the ratio of guides to riders is good, enabling them to gauge riders' needs and provide clear instruction. Given a horse named Bandit, I can't help encouraging him to canter. The wind, sea spray, late afternoon light and sound of hooves thumping sand make for an exhilarating low-tide outing". Lisa came to Nolton Stables. staying at Glebe House Bed & Breakfast, as part of the mini-series Coastal Cottage. She says that Pembrokeshire is as rugged and beautiful as Cornwall, but less crowded, and with a less stressful drive from London. See the full article. "￼WHAT WAS THE BEST PART OF THE TRIP? Our horse ride on the beach at Druidston Haven with Nolton Stables was a special experience. With no riding experience, I was worried how we would all cope on the horses, but I needn’t have. The horses were well trained and the staff taught us all to canter on the beach – something I thought we’d never achieve! The sun was shining and it was one of those memories I will treasure forever." 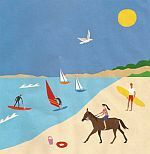 5 of the best beach rides: "With the cliffs, rocks and sands of Druidston Haven a short hack away, even four-year-olds on lead-reins can paddle a pony here. Meanwhile, happy canterers can enjoy the mile-long shoreline." 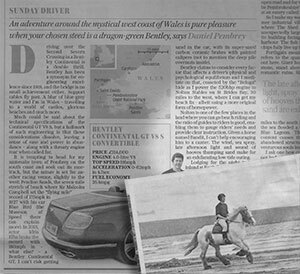 "Ruth Wignall and her family continue their quest to find some of the best days out in Wales. This week they visit the smallest city in Britain, St Davids. They take a tour around the Cathedral before pony trekking along the beach in Nolton Haven." "Beach ride, Druidstone Haven. Just 20 minutes' drive further south along the A487 and Welsh Road, set within the magnificent westerly facing St Brides Bay, this stretch of sand backed by high cliffs is a glorious spot for a late afternoon hack. Both novice and confident equestrians can enjoy an hour-and-a-half ride along the beach with the experienced team at Nolton Stables. Few things in life rival racing through the surf on the edge of the shoreline." "With spectacular beach riding along the dramatic Pembrokeshire coast, and riding packages for all abilities, Nolton Stables is ideal for families." THE hardest choice James Owen has to make at work each morning is which of five beaches to ride along and for how long. 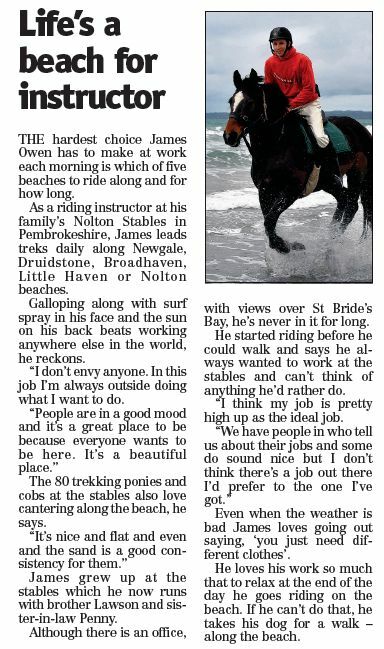 As a riding instructor at his family’s Nolton Stables in Pembrokeshire, James leads treks daily along Newgale, Druidstone, Broadhaven, Little Haven or Nolton beaches. Stay in a self-catering cottage (with the fridge stocked full of supplies for a full English). Ride for an hour and a half in the morning, with a stop off at Glebe House for lunch, and then a further hour and half riding in the afternoon along the glorious beaches. Perfect for beginners, novices, and experienced riders, there’s even chance to try zorbing in the stables’ giant zorbing ball. "With epic stretches of beach between rolling surf and towering cliffs, Nolton Stables adds a salty zing to the usual horse or pony trek. The well-staffed rides, allowing all levels to hit thier natural stride, hack down country lanes before tackling the vast wave-lashed sands of Druidston Haven. 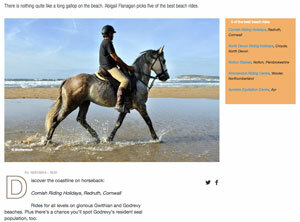 If the tide's in, you head for a 35-acre private valley, home to badgers and buzzards, while longer treks add in coastal tracks and, out of season, the chance to get your hooves wet on the two miles of beach at Newgale and Broad Haven." 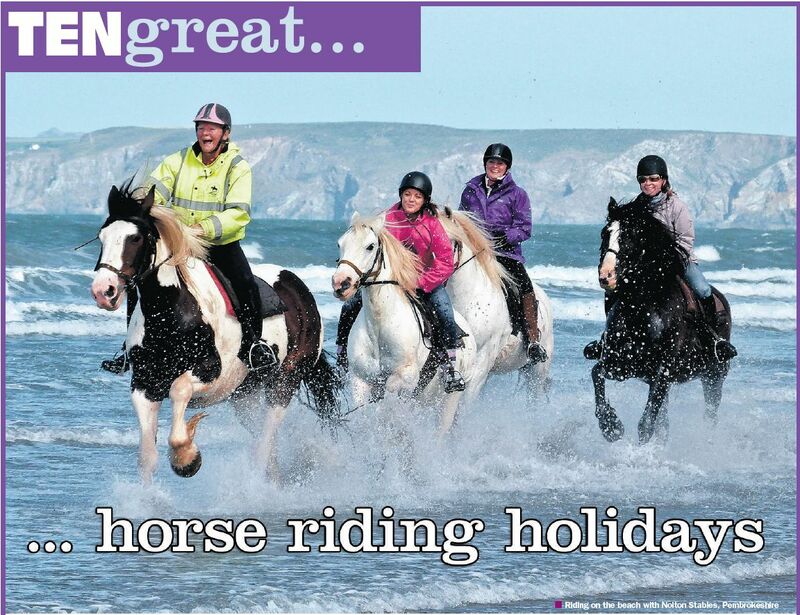 "Nolton Stables, near Haverfordwest, offers the chance to enjoy the beauty of the coastline on horseback. Go for an exhilarating ride through woods and along beaches to take in stunning scenery and splash through the surf."